Bootie celebrates Michael Jackson’s birthday with an evening filled with mashup tributes to the late, great "King of Pop." No artist, era, or genre is safe! Only $5 before 10 PM! Bootie’s DJs mix and mash MJ mashups throughout the night! 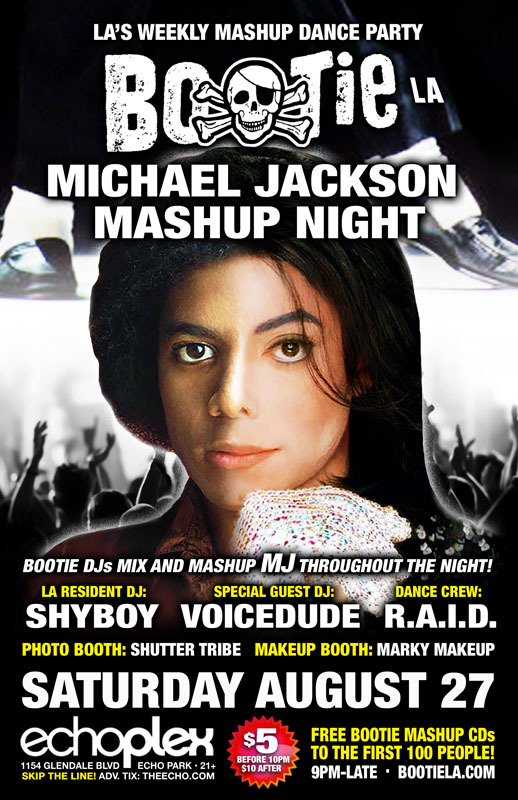 Bootie celebrates Michael Jackson with an evening filled with mashup tributes to the late, great “King of Pop.” Resident DJ ShyBoy will be joined by special guest Voicedude, as they mash up Jacko throughout the night, mixing him up with anybody and everybody! Plus R.A.I.D. fills the stage with Jacko-licious go-go insanity while Marky Makeup gives you an MJ makeover. Plus Shutter Tribe will be in the house to snap all the fun so you can remember what you did. All this, plus free Bootie mashup CDs for the first 100 people through the door!